I am missing something obvious here but I haven't been able to figure out what it is. The peanut fitting on the AC accumulator isn't sitting flush if I tighten the retaining nut. Is there a shim that I am missing or a different oring I should use? This is on a 2000 F-250 7.3. This started as a compressor and accumulator replacement. Found the leak afterwards and the peanut not sitting flush. I have replaced the line and the accumulator a second time and it still won't sit flush so I think I am doing something wrong. Measure the depth of the fitting, and measure the depth inside the accumulator hole, to make sure that it CAN fit flush. Even try without the O-ring to see if it sits flush. 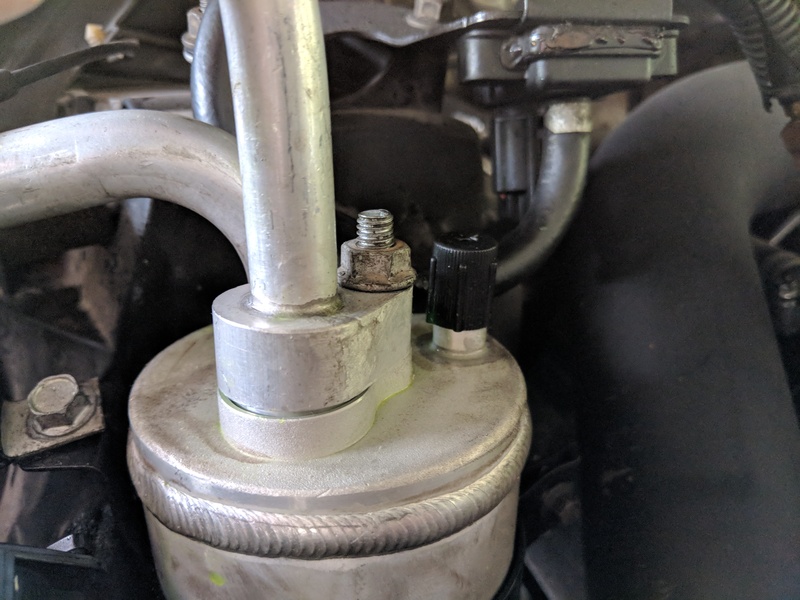 Last year I bought a replacement high pressure AC line for my 1998 Frontier, the cylindrical fitting on the aftermarket fitting extends 14mm, yet the cylindrical fitting on the original Nissan unit extends just 9.5mm. My math skills tell me that's 4.5mm difference, a TON !!! So the fitting on the new line was 5.5mm longer than on the factory one !!! I had to cut that shorter to get that to seat flush inside the compressor. The O-ring was in the same location luckily. No leaks there in 1 full year of running. Thanks. This is only when I tighten the nut. It sits flush by hand. It could be the bolt in the accumulator is bent back some, I think if it were bent more towards the hole/opening it would set more flush. You could try a washer under the nut,don't know if that might help. 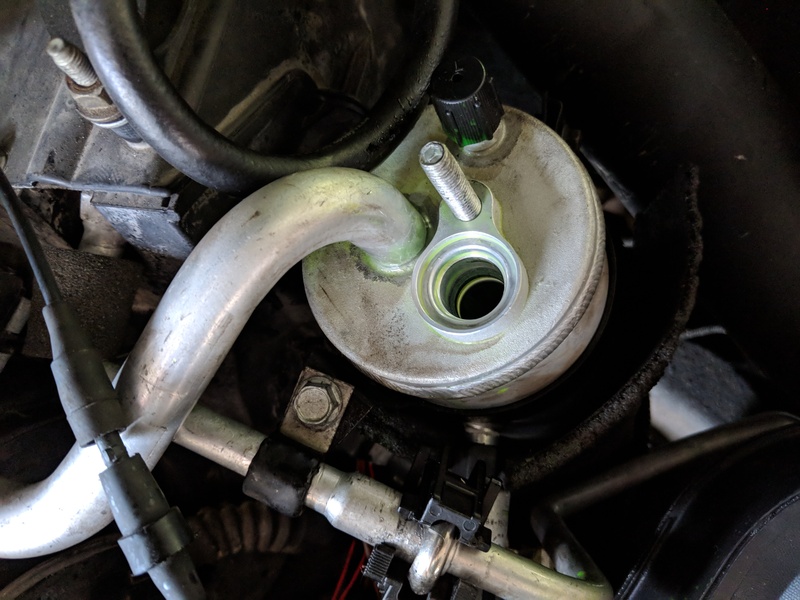 that's a very poor design, at least what would have probably been be better is, if they would have put a little hold down plate on there, sort of like fork looking plate, like what most mfg's use to hold down the distributor. Hmmm- your O-ring channel is shallower than the one pictured on my Frontier in my earlier post. The Frontier O-ring stays in its channel and seals around its sides to the cylinder that it fits in. If your channel goes all the way back to the fitting, then it seals mostly on its sides. So question is: does your "channel" extend all the way back (under the O-ring) ? Can you post a photo without that O-ring ? If your O-ring does seal on its sides, maybe a slightly-narrower O-ring would work. 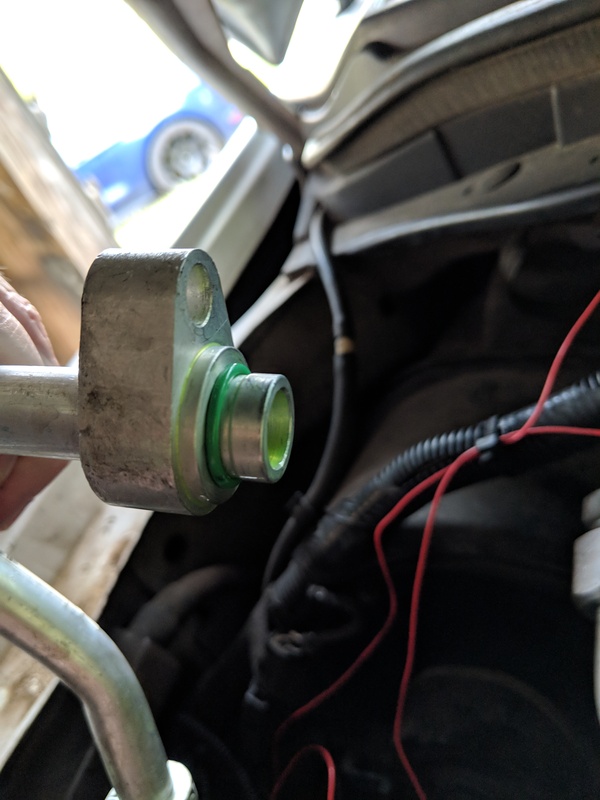 You'd need to look for a different size green refrigeration O-ring at NAPA or Carquest or similar, in the little drawers. 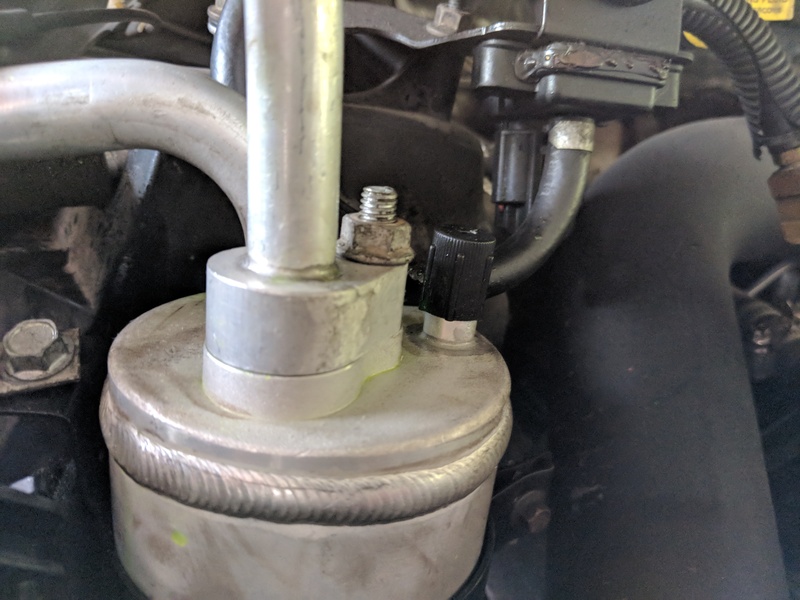 For one of my former vehicles (believe it was my 1994 Suburban, I had purchased a new accumulator which did fit, but the supplied O-rings were different thickness than the old ones, so I purchased ones at Carquest same size as the previous ones. If it sits flush when fitting it by hand but not when you tighten the nut, it seems to me that the threaded stud isn't perpendicular to the matting surface, as Mr Bill suggested. Try tightening two nuts (jam nuts) against each other on the stud, then turn it 180 degrees. 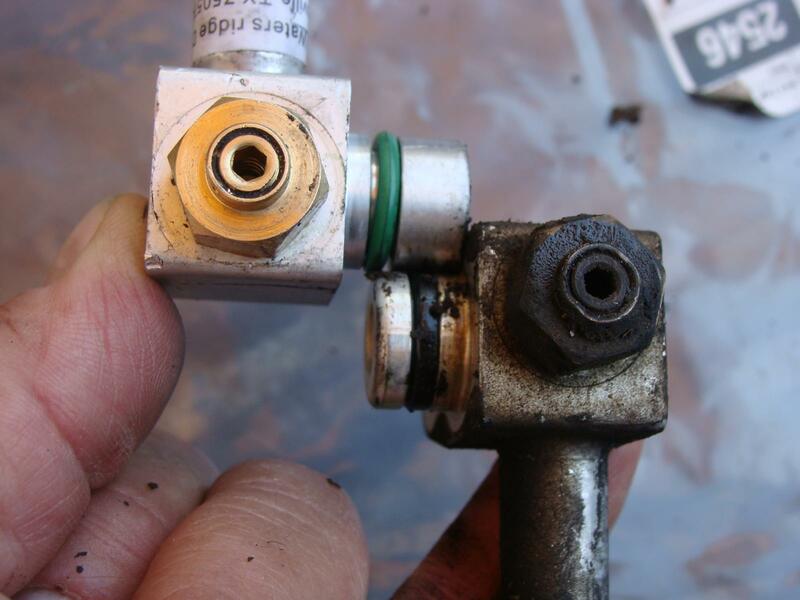 Now, remove the jam nuts, re-attach the fitting and one nut in the normal manner, and see whether it now fits flush. Alternatively, you could also try installing the old stud. It could be that the new stud is slightly bent.